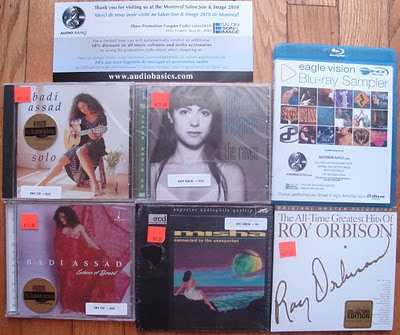 Without music, it wouldn't be much of a show and there were plenty of retailers on hand with a fantastic selection of music in all formats - LP, CD, SACD, DVD and Blu-Ray. While Audio Basics Inc. (Canadian Distributor for Crystal Cables makers of the Arabesque Speakers which we covered earlier) may not have had the largest selection of music at the show, they did have the best prices. Below are some of the "souvenirs" I took home from the show. All prices were in $CDN and included all taxes. Misha [XRCD] $9. Badi Assad (who is actually very good) [Chesky] $10 and $12. 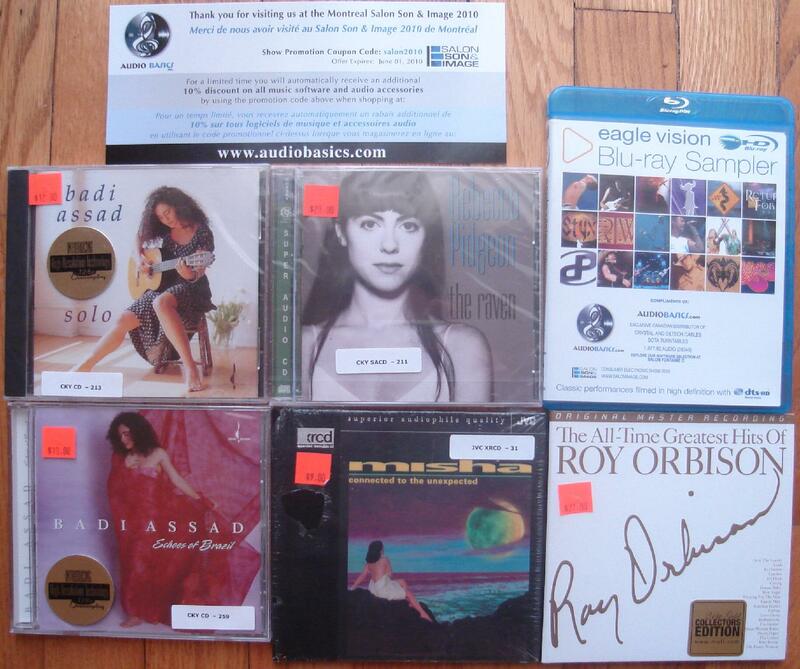 Rebecca Pidgeon [Chesky SACD] $20 and Roy Orbison [MFSL Gold] $27. Also included with my purchase was a free Blu-Ray sampler. Ironically, the very last room that I visited also turned out to be my favorite at the show. I spent well over an hour in the L'Atelier-Audio room listening to great music and chatting with Samuel Furon about their wonderful hand built audio products. 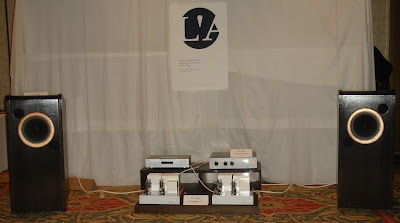 Shown in the photo above Ocellia Calliope.30 Twin Signature speakers ($TBD), Ocellia Quaero 300B - PP Signature monoblock amps ($15,000/pair) and Ocellia Quaero Pre-Amplifier Signature ($9,000). All the L'Atelier-Audio loudspeakers use high sensitivity drivers from PHY-HP and no filters are used. The beautiful hand-built cabinets have a door on the rear which allows adjustment of the open baffle speakers. 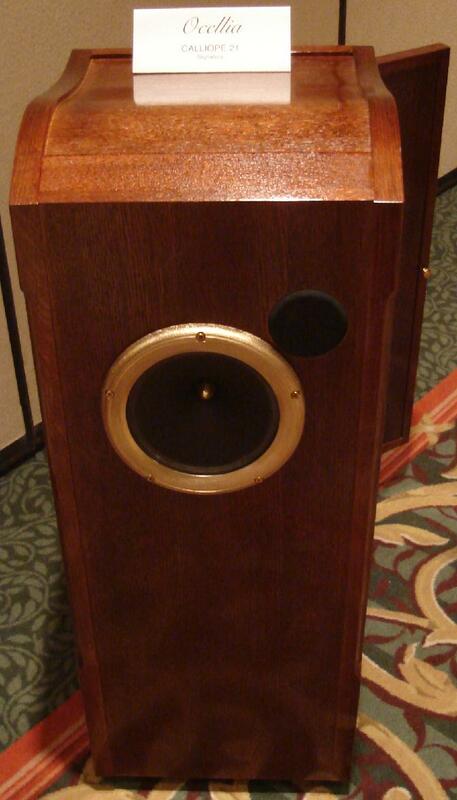 The photos below show the smaller Ocellia Calliope.21 Signature speakers. 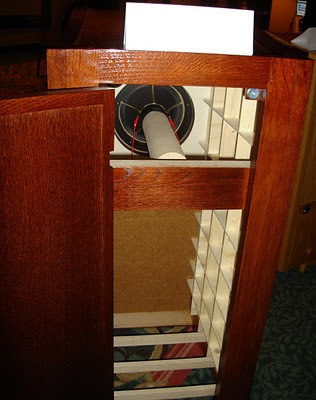 The side walls of the enclosure are only 3 mm thick and braced much like an acoustic guitar. The Ocellia Calliope.30 Twin Signature speakers were fantastic with vocals and strings and I really enjoyed listening to them. The show and Montreal were great and I'm sure I'll be back soon. Thanks for the show coverage. Almost the Chesky albums sound great and not overpriced like the premium brands. 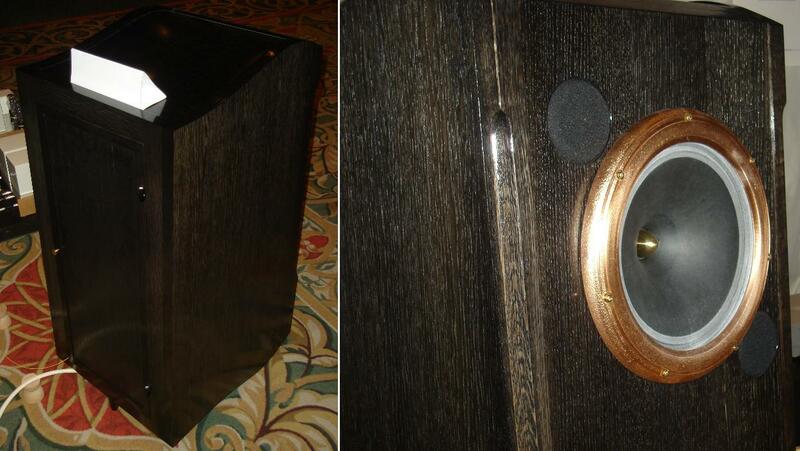 The speakers look fabulous. The French PHY-HP speakers look great too but are far too expensive for me. Does this concept seem feasible with the 12 or 15 inch Audio Nirvana drivers?